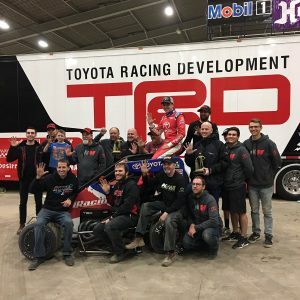 Chili Bowl 2019 is over, and nothing is surer than to expect a Keith Kunz driver to take home the Golden Driller and that’s exactly what Christopher Bell did for the third consecutive year beating team mate and NASCAR star Kyle Larson with a last lap pass. The pairs who must be part of the all-time greats swapped bang for bang in a desperate last lap bid to grab that tr easured Golden Driller. 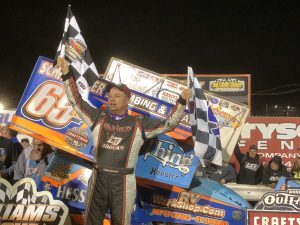 Larson as hard as he tried was again denied a Golden Driller. 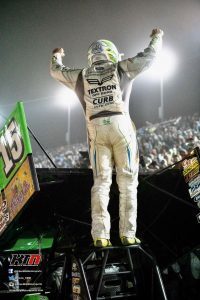 Bell a three times winner will now try in 2020 to Join Kevin Swindell as only the second driver in the history of the Chili Bowl Nationals to win four consecutive Chili Bowls. As the dust settles and the Tulsa Expo Centre returns to normal over 350 Teams have moved out and will now regroup and settle in ,get some well earned rest before the start of their 2020 season. The 40 lap Feature had a bonus pay out of $7,000 for the Holt.y Challenge if any drivers agreed to start rear of the field and make the podium after the 40 laps .You would have figured that the Yanks would have been up for the challenge but I guess with $10K cheque for the winner both McDougal and Klaasmyer had eyes on the cash. It was the Hunter Valley Hurricane the multi Australian Speercar Champion Adam Clarke and local hero Dyane Kingshott who accepted the challenge and move to the rear of the Feature field .A bit like in the old days when the fastest was always rear of the field .It was brave move by Clarke after wining the pole shuffle with wins over both Alex bright and Jason McDougal to gain the coveted pole position for the 40 lap feature .The Clarke challenge move McDougal up to pole alongside fellow tourist Alex Bright . McDougal got the better of Bright at the Start, Bright would retire on lap 8 and Klaasmeyer would move into second. Kingshott and Clarke were busy moving through from the back marks and McDougal was making the most of clean. 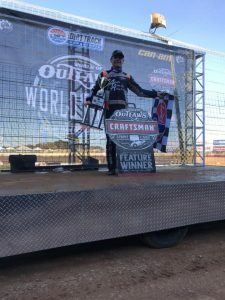 The race would run nonstop for the 40 laps limiting Clarke’s opportunities to move further ahead and he would finish the 40 laps in third just behind Klaasmeyer and Jason McDougal. Official Results John Day Classic. Heat One, 8 laps: 1. 17 Dan Golding, 2. USA7 Tucker Klaasmeyer, 3. USA4 Alex Bright, 4. 9 Vaughan Manders, 5. 19 Steven Henderson, 6. 23 Glen Mears, 7. V15 Andy Pearce, 8. S57 Robert Heard, 9. 51 Beau Doyle. DNF: 26 Keenan Fleming (5). Total Time: 2.26.204. Winning Margin: 0.648. Fastest Lap: 17.762 Alex Bright. Heat Two, 8 laps: 1. 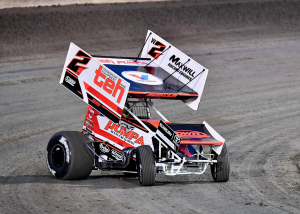 24 Dayne Kingshott, 2. USA38 Jason McDougal, 3. Q29 Adam Clarke, 4. S83 Brett Ireland, 5. 10 Dave Perry, 6. 52 Lee Redmond, 7. 15 Rob Golding, 8. 75 Steve Doyle, 9. 47 Dene McAllan, 10. 32 Stuart Yates. Total Time: 2.17. 582.Winning Margin: 0.953. Fastest Lap: 16.805 Dayne Kingshott. Heat Three, 8 laps: 1. Q29 Adam Clarke, 2. 26 Keenan Fleming, 3. 24 Dayne Kingshott, 4. USA4 Alex Bright, 5. 17 Dan Golding, 6. 15 Rob Golding, 7. 19 Steven Henderson, 8. 51 Beau Doyle. DNF: 32 Stuart Yates (2). DNS: 75 Steve Doyle. Total Time: No Time. Winning Margin: 0.741. Fastest Lap: 16.527 Dayne Kingshott. Heat Four, 8 laps: 1. USA38 Jason McDougal, 2. 52 Lee Redmond, 3. 47 Dene McAllan, 4. USA7 Tucker Klaasmeyer, 5. S57 Robert Heard, 6. 10 Dave Perry, 7. 9 Vaughan Manders, 8. S83 Brett Ireland, 9. V15 Andy Pearce. DNF: 23 Glen Mears (4). Total Time: 2.12.072. Winning Margin: 5.042. Fastest Lap: 16.347 Jason McDougal. Pole Shuffle 2, 2 laps: 1. USA4 Alex Bright, 2. 52 Lee Redmond. Total Time: 34.189. Winning Margin: 1.089. Fastest Lap: 16.912 Alex Bright. Pole Shuffle 3, 2 laps: 1. USA4 Alex Bright, 2. USA7 Tucker Klaasmeyer. Total Time: 33.791. Winning Margin: 0.295. Fastest Lap: 16.741 Alex Bright. Pole Shuffle 4, 2 laps: 1. USA4 Alex Bright, 2. 17 Dan Golding. Total Time: 33.592. Winning Margin: 0.202. Fastest Lap: 16.781 Dan Golding. Pole Shuffle 5, 2 laps: 1. Q29 Adam Clarke, 2. USA4 Alex Bright. Total Time: 33.498. Winning Margin: 0.666. Fastest Lap: 16.546 Adam Clarke. Pole Shuffle 6, 2 laps: 1. Q29 Adam Clarke, 2. 24 Dayne Kingshott. Total Time: 33.101. Winning Margin: 0.338. Fastest Lap: 16.439 Adam Clarke. Pole Shuffle 7, 2 laps: 1. Q29 Adam Clarke, 2. USA38 Jason McDougal. Total Time: 33.311. Winning Margin: 0.246. Fastest Lap: 16.458 Adam Clarke. Feature Jon Day Classic 40 laps: 1. USA38 Jason McDougal, 2. USA7 Tucker Klaasmeyer, 3. Q29 Adam Clarke, 4. 17 Dan Golding, 5. 47 Dene McAllan (39), 6. S83 Brett Ireland (39), 7. 23 Glen Mears (39), 8. 10 Dave Perry (39), 9. 15 Rob Golding (38), 10. 9 Vaughan Manders (38), 11. S57 Robert Heard (38), 12. 51 Beau Doyle (37). DNF: 52 Lee Redmond (29), 26 Keenan Fleming (23), V15 Andy Pearce (19), 75 Steve Doyle (17), 24 Dayne Kingshott (12), USA4 Alex Bright (10), 32 Stuart Yates (1), 19 Steven Henderson (0). Total Time: 11.08.740 RECORD. Winning Margin: 3.220. Fastest Lap: 16.264 Jason McDougal. 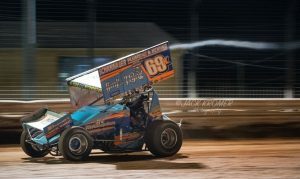 The much anticipated first up outing for Kirkke Motorsports and Kerry Madsen did not let their enormous fan base down. 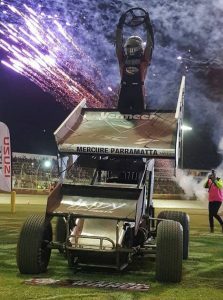 Madsen dominated, as only the Mad Man can and secured the Western Australian Sprint Car Championship for himself and Krikke Motorsports # W2 last night at the Perth Motorplex in Western Australia . 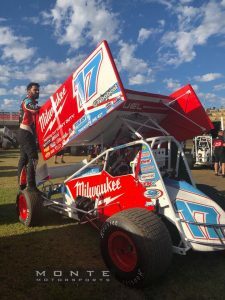 Madsen contracted with Krikke Motorsports for the full World Series Sprintcar Series across the Country ensures fans are in for a real treat.With many of the best from Australia and with imports from the USA sparks are sure to fly. 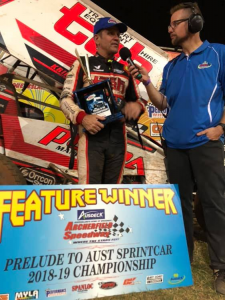 Despite the small field by our Sprint car standards, Madsen did exactly what his Team Owners were hoping for., strike first and fast. The Team has settled in quickly and must be confident of a successful season ahead. 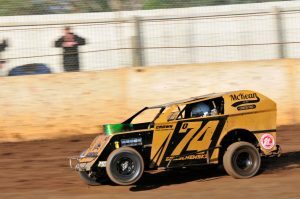 Small Country Speedways run by members normally don’t receive very much coverage outside of their local area but they are so important, they are the nursery of our Sport. At Talking Speedway, we thought it was about time we brought one such club managed Speedway to the notice of our followers. 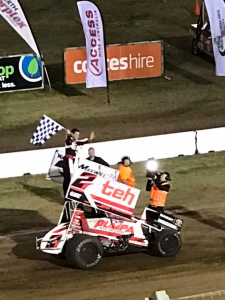 Nestled in the South Western corner of Victoria just over 100Km east from Mount Gambier the home of Borderline Speedway sits the Southern 500 Speedway at Heathmore, Portland. 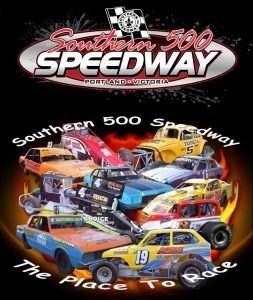 The Southern 500 Speedway is a 370 Meter slightly banked little bullring that caters for a wide division of racing classes. The racing program runs from early November to late March. 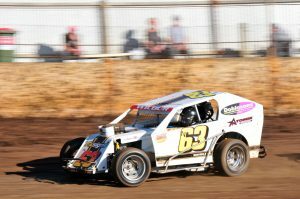 One of our contributing photographers Steve Walters from Snappertriffic Photography traveled the 100 KM from Mount Gambier to cover the racing at the November 17th meeting at the Southern 500 Speedway. The meeting featured the running of the Victorian Modlite Championship as well as many other classes. 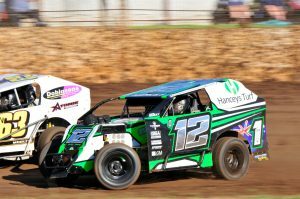 For those not familiar with the Modlite class they are the entry point that leads finally into the Block Modified where Queensland’s Peter Britten represent Australia so successfully on the US Circuit. 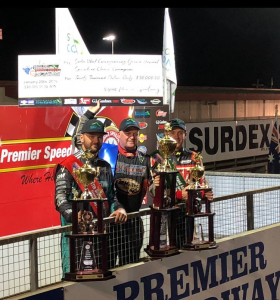 Speedways like the Southern 500 are spread across Australia and they are the nursery for future Champions of Australian Speedway. Committed locals with the support of members and local sponsors make it possible for the sport to grow and prosper. 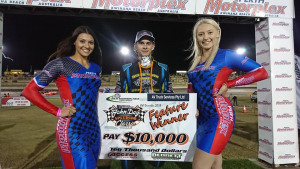 We are pleased to announce the ‘Teams Racing’ is scheduled to run as part of the United Truck Parts International Midget Series in a slightly different format. Unlike previous years, the plan is to run a single sprint race each night of the first five meetings. 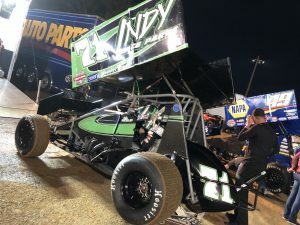 The drivers will accumulate team points from each of the meetings, and we will see the final race unfold at the King of the Springs – Bryan Clauson 39 Lapper event on Thursday 3rd January 2019. The Team selection process is that the local lads will show the selectors what they are capable of in the first 4 meetings of the season, ready for Boxing Day. Team NZ will be announced after racing on the 8th Dec. 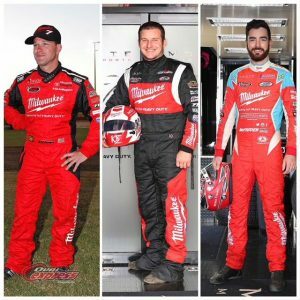 This team of three drivers will race against the other two teams at all five meetings. 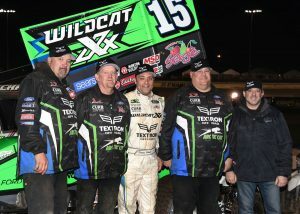 Team USA will be represented by Kyle Larson, Christopher Bell and Tyler Courtney. Team Australia has Matt Smith, Kaidon Brown and Scott Farmer. 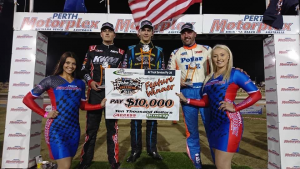 “All indications are that we will witness some of the best open wheel midget racing we have seen here at Western Springs”, said Greg Mosen – Promoter, “the team line ups are next level” he said.